For Arianne King Comer's 2018 residency, click here. As part of her residency at Lynden, Portia Cobb has invited textile artist Arianne King Comer to Lynden to share traditional batik, adire (Yoruba) and shibori (Japanese) techniques of designing on cloth. Comer will be in residence August 3-13, 2017, participating in a Free Family Day, working with the children in our collaborative camp with Walker’s Point Center for the Arts, and launching a community project to memorialize Lizzie’s Garden by creating a collective recipe book using resist dye techniques. Like several of the artists participating in the Eliza Project, Arianne King Comer is interested in the cultural traditions of the African diaspora, and much of her research focuses on indigo cultivation and dyeing. Comer travels with wax pans, imprinting stamps from the countries that practice batik, a collection of dyes--including indigo--for cotton and silk, and examples of textiles from her collection. 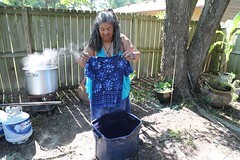 As an indigo advocate, she will share a native South Carolina indigo plant and several DVDs on the indigo process in various countries, including the iconic film Daughters of the Dust. Indigo has an ancient history, and was found in many different parts of the world, but in the 18th century the Sea Islands of South Carolina were a center of indigo production. Enslaved West Africans worked the labor-intensive indigo plantations. (Indigo was the foundation of many West African textile traditions, where women, in particular, were known for their dyeing expertise.) Indigo, along with rice and cotton, formed the basis of South Carolina’s wealth. Charleston was at the center of the indigo culture in the United States and exported vast amounts of indigo to England in this period. If you would like to participate in a resist-dyeing workshop with Arianne King Comer, please email us at pmorris@lyndensculpturegarden.org or call 414-446-8794. Arianne King Comer, a resident of North Charleston, South Carolina, since 2007, is an art consultant, indigo and community arts advocate, lecturer, teacher, and textile artist. She received her BFA from Howard University, and in 1992 she received the UN/USIS grant to study under her mentor, Nike Davies Okundaye, in Oshogbo, Nigeria. Comer was the owner of Ibile Indigo House on St. Helena Island, South Carolina, from 1998 to 2005. In 2002, she traveled to Istanbul, Turkey as a guest designer to her daughter, Nicole King Burroughs, for Mavi Jeans. She was the Artist in Residence for North Charleston’s Cultural Affairs Office from 2007 to 2008. In January 2007, she joined the Charleston Rhizome Collective at the World Social Forum in Nairobi, Kenya, where she conducted a batik/indigo workshop. The next year, she became a resident artist for Very Special Arts of South Carolina, where she convenes a master batik studio at North Charleston’s Production Center. She was recently recognized for her work with Art Access of South Carolina for providing “inclusion art” experiences for art students through Charleston County Schools.